Though the fall of Bataan ended all organized opposition on Luzon, it did not give the Japanese the most valuable prize of all, Manila Bay. So long as Corregidor and its sister forts across the entrance to the bay remained in American hands, the use of the finest natural harbor in the Orient was denied them. And before General Homma could report to his already impatient superiors in Tokyo that he had accomplished his mission, he would also have to occupy Mindanao to the south as well as the more important islands in the Visayan group in the central Philippines. The campaign for the Philippine Islands was not yet over. Though he had won the most decisive battle of that campaign, Homma still had to take Corregidor and the islands south of Luzon before the Japanese could integrate the archipelago into the Greater East Asia Co-Prosperity Sphere. Since the days of the Spaniards, Corregidor had been used as an outpost for the defense of Manila. (Map 23) By a system of semaphore signals from the island the Spaniards were able to receive warning of the approach of any hostile force in time to alert the forts in and around the capital. Later, they constructed minor fortifications on the island as an outer line of defense and as a screen for the larger guns emplaced along the Cavite shore south of Manila Bay, and at Fort Santiago in Manila. By 1898, when Admiral Dewey sailed into Manila Bay, the Spaniards had on Corregidor three large cannons, each with a range of about one mile. Two of these faced Cavite; the other pointed north toward Bataan. In addition the Spaniards had twelve other coastal guns to defend the approaches to the capital city: on El Fraile and Caballo Islands, which, like Corregidor, lay across the entrance to the bay; along the southern tip of Bataan; and along the Cavite shore. 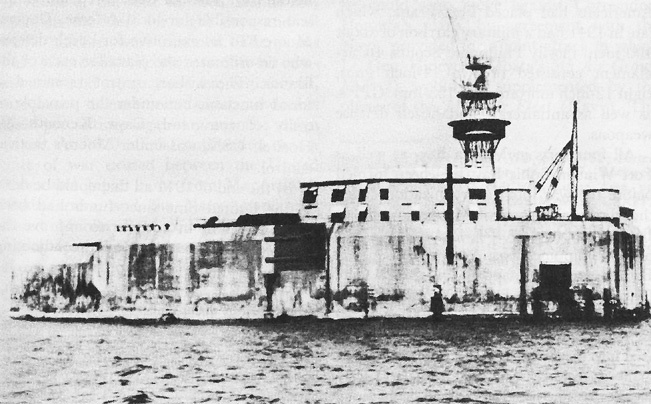 CORREGIDOR. Tip of Bataan, upper left. the decade of the 1920's struck a sharp blow at the effectiveness of this carefully wrought and vastly expensive system of defenses. Nothing could be done to remedy the weakness of the forts, however, for by the Washington Naval Treaty of 1922 the construction of additional fortifications as well as the modernization of those already built was prohibited. Major construction after 1922, therefore, was limited to antiaircraft positions and to the tunnels dug into the solid rock of Malinta Hill on Corregidor, presumably as a storage area for supplies. When the Japanese attacked in December 1941, the defenses of Corregidor and the adjoining islands were little different from what they had been twenty-five years earlier. Of the four fortified islands in Manila Bay, Corregidor, the site of Fort Mills, was the largest, measuring three and a half miles in length and one and a half miles at its widest point. 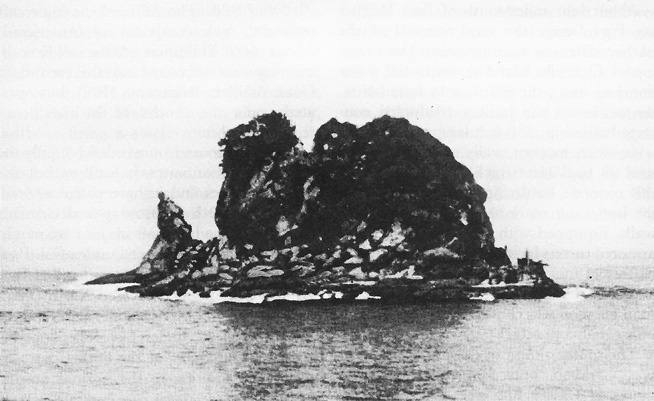 With its bulbous head pointed toward the west and its tail stretching eastward, this tadpole-shaped island separated the bay entrance into a north and south channel. Corregidor had narrowly missed being two islands, for at the junction of the head and tail it narrowed to 600 yards and dropped to a height only slightly above sea level. This low area was known as Bottomside and contained two docks, the barrio of San Jose, shops, warehouses, a power plant, and cold-storage units. Directly to the east of Bottomside was Malinta Hill with its labyrinth of tunnels. Beyond, stretched the tail of the island, where a small airfield and a navy radio intercept station were located. MALINTA HILL, looking south. Low area, center, is Bottomside. were located the hospital, quarters for commissioned and noncommissioned officers, a service club, and two schools for the children of the island. Beyond, lay the heavy head of the tadpole, rising 500 feet above the sea. Called Topside, this area contained the headquarters, barracks, and officers quarters, grouped around the traditional parade grounds. The ground was high almost to the beach line where it dropped precipitously to the water's edge. Cutting into the cliffs were two ravines, James and Cheney, which gave access from the beaches to the crowded area above. These ravines, together with Ramsey Ravine which led to Middleside, were the critical points in the defense of Corregidor against hostile landings. Source: Harbor Defenses Rpt of Opns, Annex C.
guard against its destruction by bombardment. The most extensive construction on Corregidor was the tunnel system under Malinta Hill. 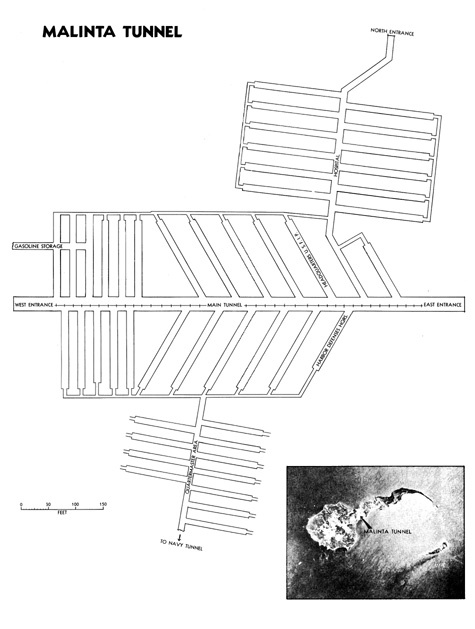 Consisting of a main east-west passage 1,400 feet long and 30 feet wide, the tunnel had 25 laterals, each about 400 feet long, branching out at regular intervals from each side of the main passage. The underground hospital was housed in a separate system of tunnels north of the main tunnel and had 12 laterals of its own. It could be reached either through the main tunnel or by a separate outside entrance on the north side of Malinta Hill. Opposite the hospital, under the south side of Malinta, was the Navy tunnel system, connected to the main tunnel by a partially completed low passageway through the quartermaster storage lateral. Reinforced with concrete walls, floors, and overhead arches, blowers to furnish fresh air, and a double-track electric car line along the east-west passage, the Malinta Tunnel furnished bombproof shelter for the hospital, headquarters, and shops, as well as a vast labyrinthine underground storehouse. The armament of Corregidor was formidable. Its seacoast defense alone consisted of 23 batteries, many with their own names and traditions. 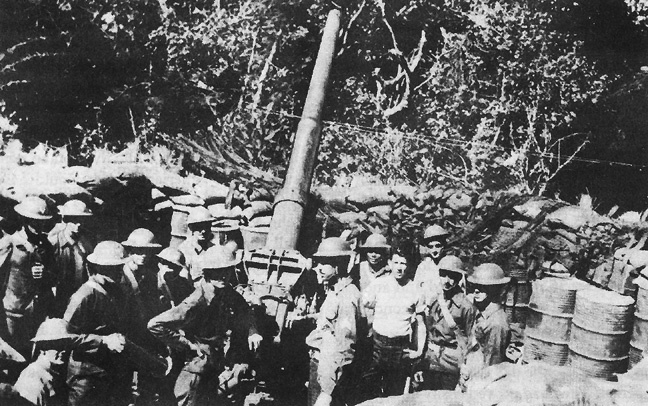 Altogether, Corregidor had a total of 56 coastal guns and mortars, all of World War I vintage, ranging in caliber from 3 to 12 inches. (Table 9) The longest range cannon were the two 12-inch guns of Batteries Smith and Hearn, with a horizontal range of 29,000 yards and all-around traverse. In addition, there were six 12-inch guns with a range of 17,000 yards, and ten mortars of the same caliber. Nineteen of Corregidor's guns were the 155-mm. GPF's, capable of a range of 17,000 yards. The ten 3-inchers had the shortest range. The supply of seacoast ammunition was ample but there was little of the type suitable for attacking land targets and no star shells to provide illumination for night fire. North and south of the island were extensive mine fields planted by the Army and Navy. Antiaircraft equipment consisted of 3- inch guns with a vertical range of 27,000 and 32,000 feet (depending on the type of ammunition used), .50-caliber machine guns, and 60-inch Sperry searchlights. Defending Corregidor from air attack were 24 of these 3-inch guns, 48 machine guns and 5 searchlights. Another battery of 3-inchers was emplaced on the southern tip of Bataan to tie in with these on Corregidor. Ammunition for the antiaircraft weapons was less plentiful than that for the seacoast guns, and there was a critical shortage of mechanically fuzed 3-inch high explosive shells. Source: Harbor Defenses Rpt of Opns, Annex C; Brig Gen Samuel L. Howard, Rpt on 4th Marines, p. 18, USMC Hist Sec. Before the war, the Corregidor garrison consisted principally of headquarters, artillery, and service troops. The combined strength of the four fortified islands in Manila Bay at that time did not exceed 6,000 men, most of whom were stationed on Corregidor. After 8 December the population of these garrisons swelled rapidly. First came the survivors of the Cavite naval base, then the headquarters and service troops from Manila. 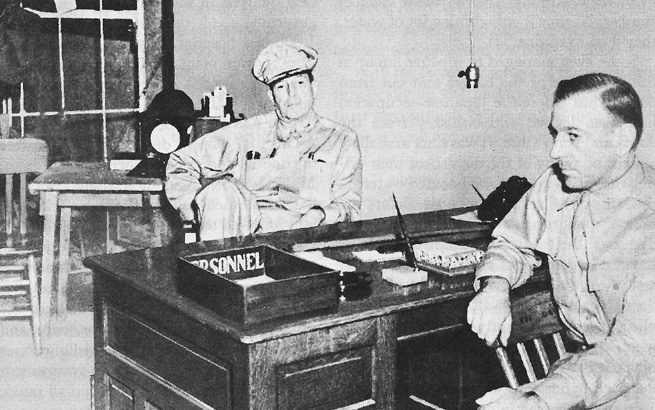 MacArthur's headquarters was established on Corregidor on 25 December and with it came the 809th Military Police Company, two ordnance companies, an engineer company, and service detachments. When Olongapo was evacuated on 26 December, the 4th Marines were also transferred to Corregidor, swelling its population by over 1,000 men. Before the first blow hit that island, it was already crowded with the men of all services and a dizzying pyramid of headquarters. FORT DRUM. El Fraile Island before the concrete battleship was constructed, above; and after, below. About four miles south of Fort Hughes lay Fort Drum, the most unusual of the harbor defenses. Cutting away the entire top of El Fraile Island down to the water line and using the island as a foundation, the engineers had built a reinforced concrete battleship, 350 feet long and 144 feet wide, with exterior walls of concrete and steel 25 to 36 feet thick. The top deck of this concrete battleship was 40 feet above the low-water mark and had 20-foot-thick walls. Equipped with four 14-inch guns in armored turrets facing seaward, a secondary battery of four casemated 6-inch guns, and antiaircraft defense, the fort with its 200- man garrison was considered, even in 1941, impregnable to attack. The southernmost of the fortified islands was Carabao, only 500 yards from the shores of Cavite Province. Except at one point along its eastern shore, the island rises precipitously from the sea in cliffs more than 100 feet high. On this uninviting island the Americans had placed Fort Frank, which late in 1941 had a military garrison of about 400 men, mostly Philippine Scouts. Its armament consisted of two 14-inch guns, eight 12-inch mortars, four 155-mm. GPF's, as well as antiaircraft and beach defense weapons. General Moore commanded not only the seacoast and antiaircraft artillery but the beach defenses and inshore patrol as well. To exercise tactical control over all elements of his force, he had four major commands. Seaward defense he placed under Col. Paul D. Bunker who, in turn, commanded four groups, two of which covered North Channel and two South Channel. All antiaircraft units were under Col. Theodore M. Chase, commander of the 60th Coast Artillery. In addition to the normal mission of providing defense against air attack, Chase also maintained an air warning service for the fortified islands and for vessels in the bay. Though each fort commander was responsible for local defense, General Moore had an executive for beach defense who co-ordinated the plans for each of the islands. The inshore patrol remained a naval function, but under the principle of unity of command, Capt. Kenneth M. Hoeffel, USN, was under Moore's tactical control. islands had been accomplished.3 But the basic weakness of the harbor defenses- their vulnerability to attack from the air and from their landward flanks-was never corrected. They accomplished their mission, the denial of Manila Bay to the enemy, without firing a single round at a hostile warship; Japanese cruisers and destroyers blockading the bay stayed well out of range of Moore's heavy guns. But when Bataan fell the flank protection of Corregidor disappeared and the fortress was left exposed to destruction by air and artillery attacks and to landings by hostile forces. Almost exactly on schedule, at 1154 of the 29th, the first flight of 18 twin-engine bombers of the 14th Heavy Bombardment Regiment, covered by 19 fighters, approached Corregidor at a height of 15,000 feet and in regular V formation. The flight broke into smaller flights, of 9 and 3 planes, which passed lengthwise over the island, then back, dropping 225- and 550-pound bombs on the headquarters buildings and barracks. For the half hour they were over the target, the planes of the 14th Heavy Bombardment dropped almost fifty bombs. At 1230, 22 bombers of the 8th Light Bombardment Regiment, accompanied by 18 dive bombers of the 16th Light Bombardment Regiment, had their turn. The light bombers followed the same pattern as the first flight, dropping their sixty-six 225- pound bombs on installations and buildings on Bottomside and Topside. The dive bombers, loaded with 35-pounders, attacked from an altitude of 3,000 feet, though to the men on the ground the planes appeared to be at treetop level. When the dive bombers left at 1300, the Navy bombers came in. Numbering about 60 planes, the naval formation continued the attack against the island and shipping in the bay for another hour. Altogether, the Americans estimated, the Japanese used about 81 mediums and 10 dive bombers and dropped about 60 tons of bombs during these two hours. None of the few remaining American aircraft rose from the recently established fighter base on Bataan to dispute their supremacy of the air on this occasion or during any of the attacks that followed. The dive bombers, too, were met by strong and effective opposition. The .50- caliber machine guns of the antiaircraft command downed four of the planes in their first low-level strafing attack. Thereafter, according to American sources, the Japanese did not again attempt to dive-bomb targets on Corregidor until the end of April. that "the whistle of my descent must have rivalled that of the falling bomb. "8 Others were equally surprised and displayed a tendency to head for the corners of the rooms where they fancied they were safer than elsewhere. Fortunately windows and entrances had been sandbagged and broken glass caused few casualties. The first bombs hit the vacated station hospital and many of the wooden structures on Topside and Middleside. One bomb struck the post exchange, went through the roof and three concrete floors, buried itself in eight feet of earth, and left a crater about twenty feet in diameter. Fully half the barracks and headquarters buildings were demolished and only a part of the foundation of the officers' club remained after the bombing. Many of the structures were of corrugated iron, and the danger from flying bits of metal was often as great as that from the bombs. Bottomside, after the bombing, appeared to be "one huge mass of jagged and bent sheet iron. "9 Fire sprang up at many points so that to an observer on Bataan the island appeared to be enveloped "in clouds of dust and black smoke. "10 Altogether about 60 percent of all wooden buildings on Corregidor were destroyed during the first bombings. Headquarters, USAFFE, promptly moved into Malinta Tunnel the next day. Fortunately, damage to military installations, the major target of the Japanese aircraft, was comparatively slight. Two of the gun batteries suffered minor damage which was repaired within twenty-four hours. Several of the small vessels docked at Bottomside and at anchor near the island were hit, and two Philippine Army planes at Kindley Field on the tail of the tadpole were destroyed. Power, communication, and water lines were temporarily disrupted but little permanent damage was wrought. Casualties for the day were twenty killed and eighty wounded. After the first bombings there was a marked change in the reaction of the men. Before the 29th, despite warning, they had crowded the doorways and windows to watch the planes and speculate about probable targets, safe in the knowledge that Corregidor would not be hit. "All of us," wrote Captain Ames, "were too careless of bombs and bullets at first. "11 But that attitude quickly changed. "Now," noted Colonel Bunker, commander of the Seaward Defenses, "they all stampede for the nearest cover and get as far under it as possible. "12 As a matter of fact, it soon became difficult to get some of the men out of their shelters, even when there were no planes overhead. For the next eight days, until 6 January, the Japanese continued to bomb Corregidor intermittently, with less and less effect and at greater cost to themselves. There were no enemy aircraft over the island on the 30th, when President Quezon was inaugurated for the second time, or on the 31st. There is some indication of air action on the first day of the New Year, but it was on the 2d, the date Manila was occupied, that the Japanese came back in force. The bombardment of the 2d was the beginning of a five-day assault during which hardly a yard of the island did not feel the effects of the enemy bombs. Except for the attacks on the 2d and the 5th, the sole enemy target was Corregidor. On the 2d, Fort Drum, and on the 5th, Fort Frank came in for their share of the bombs but were never the primary targets. The pattern of the daily Japanese attacks was usually the same. 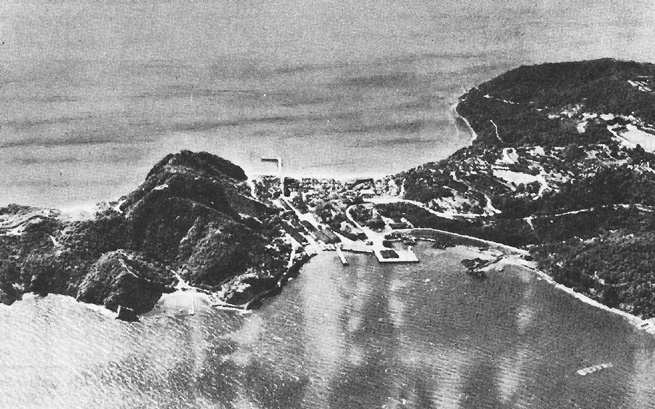 During the morning a lone photo reconnaissance plane, whose pilot the Americans referred to familiarly as Photo Joe or The Lone Ranger, would circle Corregidor and the other fortified islands for a time and then return to base. About 1230 the bombers would come in, flying at an altitude well above 20,000 feet and at a speed of about 160 miles an hour, bomb the island for about two hours, then fly off. Until the last day, they approached the target from the same direction in a large V formation, then broke up into smaller formations for the run over the island. Only at the end did the Japanese abandon this regular formation and approach the target from different directions in scattered formations and at varying altitudes. Total damages for the six days' bombing were extensive. On the 2d and 3d the buildings on Topside and Middleside were hit again and two of the island's precious water tanks destroyed. On the 4th the principal target was the wharves, shops, and warehouses on Bottomside. The next day a barge was bombed and set afire. It drifted into shore and set fire to a diesel oil dump near the power plant. On the 6th there was a tragic accident when thirty-four men took cover in an incomplete bomb shelter. A large bomb fell near the structure, which collapsed and killed thirty-one of the men. By the 7th practically all unprotected surface installations had disappeared or were in ruins. Bomb craters were uniformly scattered over the island and one could hardly walk more than twenty-five yards in any direction without stumbling into one. bombs. Much material, such as lumber, hardware, mattresses, and medical and chemical warfare supplies, which had been stored on the surface in wooden buildings, was burned. Concrete structures suffered less from the bombings and from fire, and the supplies stored in them were salvaged. After the first attack no effort was made to keep the electric railroad line on the island in operation. It had been hit in so many places and was so exposed that it was fruitless to attempt its repair. Almost daily the main telephone cables were cut by bombs. Crews worked at night to repair them, but the next day the lines would be cut again. The maintenance of communications was a never-ending task, and there was never time to bury the cables deep enough to place them out of reach of the bombs. The armament of the island suffered comparatively slight damage. The coastal batteries with their magazines and power plants had been bomb-proofed before the war and escaped almost unscathed. The more exposed antiaircraft units suffered more from the bombings than the seacoast batteries, but such damage as was caused was repaired quickly, usually within twelve hours. There were some casualties among the gun crews, but they were not serious enough to interfere with operations. The largest number of casualties came to those who failed to take shelter or were careless. There is no record of the total casualties for the period from 29 December to 7 January, but at least 36 men were killed and another 140 wounded during the first, second, and last days of the attack alone. The air attacks against Corregidor ended on 6 January, the day the Bataan campaign opened. They had proved costly to the Japanese and had produced no decisive military results. But even if they had and if Homma had wished to continue to bomb the island after 6 January, he would have been unable to do so. By that time the 5th Air Group was preparing to move to Thailand, and Homma was left with only a small air force which he could ill spare for attacks against Corregidor. Except for sporadic raids by three or four planes and occasional dive bombing and strafing, the first aerial bombardment was over. Events thus far had not worked out as the Japanese had planned. The occupation of Manila had not given them the use of its fine harbor or the large military stores they had expected to find there. MacArthur had refused battle on the plains of Manila, and drawn his forces back into the Bataan peninsula intact. The occupation of Corregidor, which was next on the Japanese timetable, now had to be deferred for the lengthy and expensive campaign on Bataan. If the first air attacks against the island fortress had been intended as the prelude for a landing, they had been wasted. The southern shore of Manila Bay offered only partial protection to the islands lying at the bay entrance. Here the ground was less mountainous and overgrown than on Bataan, and in the vicinity of Ternate, opposite the tip of Bataan, there were few obstacles to military movement. Into this area could be brought heavy equipment and siege guns. Once emplaced, these guns could bring the southernmost of the islands, Forts Frank and Drum, under assault. It was from here that the next attack against the harbor defenses came. Toward the end of January reports began to reach Corregidor of the movement of Japanese artillery into Cavite Province. By the 25th, according to observers on the mainland, the Japanese had emplaced their guns in defiladed positions near Ternate, only about six air miles from Fort Drum on El Fraile Island and eight miles from the neighboring Fort Frank on Carabao Island. The reports were correct. A Japanese artillery unit called the Kondo Detachment was indeed moving into position along the southern shore of Manila Bay. Formed by 14th Army on 24 January, this unit was under the command of Maj. Toshinori Kondo and consisted initially of four 105- mm. guns and two 150-mm. cannons. Kondo's orders were "to secretly deploy" near Ternate and "prepare for fire missions" against Corregidor, El Fraile, and Carabao Islands and against shipping in Manila Bay.16 By the first week of February, despite interdiction fire from Fort Frank, Kondo had completed his preparations and was awaiting further orders. He did not have long to wait. On 5 February, his orders arrived and next morning at 0800 the Kondo Detachment opened fire against the fortified islands. Fort Drum was the principal target that day and the Japanese guns hit it almost one hundred times during the three-hour attack. By accident or design, the choice of the early morning hours for the attack placed the sun behind the Japanese and made observation by the Americans difficult. They replied as best they could with their 14- and 6-inch guns, and Fort Frank assisted with its 12-inch mortars, but scored no hits. Thus began an artillery duel that was to continue intermittently for almost two months. Until the middle of February the daily attacks followed much the same pattern. Major Kondo's 105's and 150's usually opened fire in the morning, to be answered by counterbattery fire from the large guns of the harbor defenses. Later the Japanese fired at odd intervals during the day. Forts Frank and Drum, closest to Ternate, received the heaviest weight of shells and the greatest damage but their guns were never put out of commission and their effectiveness never seriously impaired. 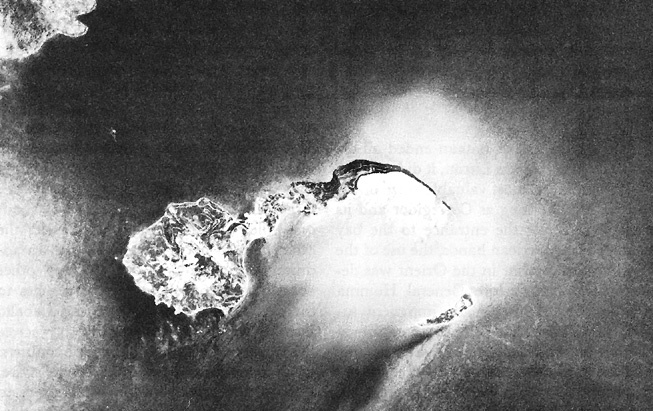 Damage to Corregidor was limited to occasional hits on buildings and vehicles. During the course of the bombardment the Japanese hit upon a scheme to strike a vital blow at Fort Frank without firing a single shot. Learning from the natives that the fort received its supply of fresh water from a dam near Calumpan on the Cavite shore, they dispatched a demolition squad to locate and destroy the pipeline. On 16 February, the Japanese found the line and pulled up the section just below the dam. evacuation of Fort Wint in December, directed that it be placed in operation at once. But its use required valuable fuel and Boudreau was understandably reluctant to expend the gasoline he needed for his guns to distill sea water. On the 19th, therefore, he made an effort to repair the pipeline and sent a group of fifteen volunteers to the mainland for that purpose. Before the men could restore the line they were attacked by a Japanese patrol of about thirty men. In the fight that followed, the Americans and Filipinos, with the support of 75-mm. guns from Fort Frank, destroyed the entire patrol, suffering only one casualty.17 The fifteen men then returned to Fort Frank safely but without having accomplished their mission. That night the Japanese retaliated by burning the barrio of Calumpan. It was not until 9 March that Colonel Boudreau was able to repair the broken water pipe. The slackening of enemy fire at the end of February did not mean that the attack was over. On the basis of intelligence reports, General Moore concluded that the Japanese were merely "marking time waiting for reinforcements. "20 This view was confirmed when native informants reported that the Japanese were selecting new gun positions in the Pico de Loro hills southwest of Ternate and improving the trails leading into the interior. In an effort to hinder this move, General Moore ordered his seacoast batteries to place interdiction fire on roads and bridges in the vicinity of Ternate, but without observable effect. The Japanese continued to make their preparation for a fresh attack without serious interference from the coastal batteries in the bay. The Japanese force which assembled in the Pico de Loro hills during the first two weeks of March was considerably stronger than the Kondo Detachment. To that unit had been added the 1st Heavy Artillery Regiment, the 2d Independent Heavy Artillery Battery, both equipped with 240-mm. howitzers, and the 3d Tractor Unit with prime movers for the heavy guns. The Kondo Detachment had been dissolved and a new organization, the Hayakawa Detachment, formed. Col. Masayoshi Hayakawa, commander of the 1st Heavy Artillery, led the reorganized force, and, according to the usual Japanese practice, gave it his name. By 15 March all preparations for the stepped-up artillery bombardment of the harbor defenses had been completed. The attack continued with unabated vigor the next day and with varying intensity for five days thereafter. As on the 15th, all four forts came under fire, but the weight of the attack was again directed against the two southernmost islands. The heaviest bombardments came on the 16th and 21st. On both days the concrete battleship fairly shook under the impact of the large shells. Every time one of them hit the casemate of the 6-inch guns a flash of fire was observed, and during the height of the attack there were fire alarms as often as every five minutes. Fortunately there was no general conflagration and no serious damage. The damage wrought by the artillery attacks between 15 and 21 March was considerably greater than any inflicted by the 105's and 150's of the Kondo Detachment. Fort Frank, the larger target and the one closest to the enemy, was the most vulnerable of the forts and "got a fearful working-over. "23 All of its surface guns-four 3-inch antiaircraft and four 155-mm. GPF guns- were visible to the enemy and were badly damaged. The depressed 12-inch mortar battery and two 14-inch disappearing guns were also hit, but were quickly repaired and put back in action. Fort Drum, the concrete battleship, came under as severe a bombardment as Frank, but was better able to withstand the battering. Every square foot of the interior surface of the casemates was deeply dented and torn by fragmentation, and between eight and fifteen feet of its reinforced concrete deck was whittled away. But though its two antiaircraft guns were ruined beyond repair, the principal target of the Japanese, the 14-inch turret guns, were never put out of action. caution was a wise one, for the Japanese did actually plan to capture both Forts Frank and Drum, and had even designated the unit which was to make the assault. General Homma canceled this plan, however, in order to strengthen the force he was assembling late in March for the final attack against Bataan. The landing craft which had been collected for the attack, about forty-five bancas, were later destroyed by 75-mm. gunfire from Fort Frank. Throughout the long-range artillery duel the effectiveness of American counterbattery fire was limited by the difficulty of locating the Japanese guns. There was no flash during daylight, and both Kondo and Hayakawa were careful to take every precaution to avoid giving away their position. They camouflaged their guns skillfully, moved them when necessary, and even sent up false smoke rings when their batteries were in action. The American and Filipino artillerymen tried to fix the enemy's position by the use of sound waves, but this method proved too delicate and complicated. Another method, admittedly less accurate but easier to use, was to compute the enemy's position by the line of falling duds. The results could rarely be checked, but the batteries of all four forts fired daily, hopeful that they might knock out some of the Japanese guns with a lucky hit. For a time firing data was received from a small group of volunteers on the mainland led by Capt. Richard G. Ivey of the 60th Coast Artillery (AA). Ivey had established an observation post on high ground along the south coast of the bay and, until he was driven out on 15 February, served as a spotter, sending his information by walkie-talkie radio. Even this observed fire proved of doubtful effectiveness. During one bombardment, when Ivey's reports appeared inconsistent, the fire control center asked him how he knew there was a Japanese gun in the position. "He replied," wrote Colonel Bunker, "that he couldn't see it, but judged by the sound that it was there. "24 When fire was shifted to another target, the observer's instructions, which failed to distinguish between deflection and range, were just as confusing and the fire was discontinued. Rarely was General Moore able to secure the services of the few remaining aircraft to fly reconnaissance. When he did the results were most gratifying. One such occasion came on 9 February, when Capt. Jesus A. Villamor, in an obsolete Philippine Army training plane equipped with a camera, set out to take photographs of the Ternate area. Protecting his slow and unarmed biplane were six P-40's. Villamor completed his mission, but on the way back the formation was attacked by six enemy fighters. While Villamor came in with his precious photographs, the P-40's engaged the enemy in a spectacular fight over Bataan. In the space of a few minutes the American pilots brought down four of the enemy fighters and fatally damaged the remaining two. Only one P-40 was lost.25 Meanwhile the photographs taken by Villamor were printed and rushed to Corregidor where they were collated with reports from observers on the ground. The counterbattery fire that followed proved remarkably accurate and several direct hits were scored. 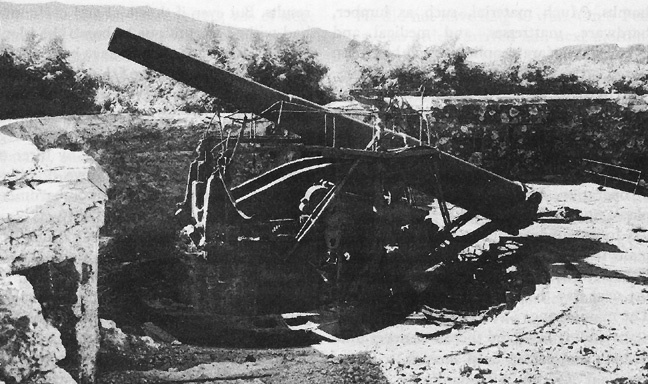 The only weapon in the armament of the harbor defenses with the high trajectory required to deliver effective counterbattery fire under these circumstances was the 12- inch mortar. There were twenty-two of these pieces on the four islands, but their usefulness against land targets was limited by the lack of sound ranging equipment and the shortage of ammunition with instantaneous fuzes. There was an ample supply of armor-piercing, fixed, delay fuze ammunition with a small bursting charge. This type was designed for use by coast artillery against warships but was of little use in the situation the Seaward Defenses then faced. These shells buried themselves deep in the earth before exploding and caused little damage to men and installations near by. The. ideal ammunition against the targets presented by the Japanese guns on the Cavite shore was the personnel type with instantaneous point detonating fuze. There were about 1,000 such shells, of 12-inch caliber and weighing 670 pounds, but even this small amount could not be used freely, for it would be desperately needed when Bataan fell and the enemy placed his heavy guns on the slopes of the Mariveles Mountains. A small quantity of additional instantaneous fuze ammunition was obtained as a result of experiments made by Colonel Bunker, He modified the fuze of the 1,070- pound shells used in the 12-inch guns by removing the .05-second delay pellet, thus detonating the shell more quickly. When he test-fired two such shells he got "beautiful results, up to my wildest hopes." The effect, he noted, was equal to that of a personnel shell, "both in dirt thrown up and in noise made. "27 But though the modified projectile exploded on impact, it had only a small bursting charge and a limited effect. Thus, despite every effort to secure effective counterbattery fire, the Americans were never able to prevent the Japanese from firing almost at will. The artillery duel which had begun early in February came to an end on 22 March. Though the Americans reported artillery fire from the Cavite shore until early in April, it could not have come from the Hayakawa Detachment. That force had been disbanded on the 22d and its elements ordered to rejoin their parent units for the final attack against Bataan, then about to open. Whatever guns remained behind were of smaller caliber and were intended only to annoy the defenders. strengthened by the addition of an 8-inch gun with a range of 24,000 yards and a 360-degree traverse. This gun was brought over from Bataan and mounted on a prepared concrete base near Malinta. Though it was tested and ready for use by 4 March, no crew was available and the gun never fired a shot at the enemy. At Fort Hughes, one 155-mm. gun facing the sea was dismounted, moved through the tunnel, and emplaced on the opposite side of the island, pointing toward Bataan. Vital installations were strengthened in various ways. Around the large well at the west end of Malinta Tunnel the engineers placed a circular parapet of sandbags, and over the gasoline storage area on Morrison Hill they placed two feet of heavily reinforced concrete, which they then camouflaged. Similar protection was given the Harbor Defenses telephone exchange at Topside. Near the entrance to Malinta Tunnel and in the port area at Bottomside, the engineers constructed tank obstacles consisting of square concrete posts reinforced with steel rails. About the same time, they placed roofs over the 75-mm. guns supporting the beach defense troops to give them protection against dive bombers. Shortcomings in the design and location of various installations had become apparent by this time and these were corrected when the intensity of the enemy fire declined. Early plans had not taken into consideration the possibility of artillery fire from the Cavite shore and some of the tunnel entrances now faced the oncoming shells. After one attack Colonel Bunker checked his firing data and concluded that the main entrance to the Seaward Defenses command post "now points exactly along the Jap trajectory. "28 Where possible, other openings were constructed, but in most cases protection was provided by baffle walls. nessed Quezon's second inauguration in an impressive ceremony at the mouth of the tunnel and listened to speeches by the President, the High Commissioner, and General MacArthur. Some saw, too, larger sums of money and more gold than they had ever imagined in their youthful dreams of pirate treasure chests. But values change in war and they watched without visible emotion the unloading of the gold, silver, and securities of the Philippine treasury on the Corregidor docks and their removal to a strong room deep in the tunnel. siege, and there were few opportunities for recreation. During their idle moments men discussed the most fantastic rumors, deplored the lack of support from the United States, and commented smugly about the invariably misinformed "brass hats in Malinta Tunnel." And always the men exercised the immemorial right of the soldier to "gripe." The days passed thus with monotonous and dreary regularity, filled with work, idle conversation, and speculation about the future. gether, forty-five of the sixty twin-engine bombers of the 60th and 62d Heavy Bombardment Regiments and the two squadrons of naval land-based bombers participated in the first day's attack to drop a total of seventy-one tons of bombs. The next day the Japanese sent only three Army squadrons, twenty-seven planes, against Corregidor; the Navy, a similar number. This pattern continued until the 29th, the Navy planes alternating with the Army bombers. In addition small groups of planes came in over Corregidor every two or three hours "to carry out the psychological warfare and destroy the strong points, without failure. "40 The routine bombings continued steadily until 1 April, with at least one Army squadron attacking during the day and another at night. The Navy planes, which had no missions on Bataan, continued their bombardment of the island fortress in undiminished strength. For the men on Corregidor it seemed as though they were living "in the center of a bull's-eye. "41 During the last week of March there were about sixty air-raid alarms lasting for a total of seventy-four hours. Bombings begun in the morning were usually resumed in the afternoon and again at night. Since the Japanese planes were now based on Clark Field or near Manila, they were able to remain over the target for longer periods than they had during the first bombardment in December. A graphic picture of the intensity of the bombardment can be gained from General Moore's summary of the first day's action. .....0707-Batteries Woodruff [Ft. Hughes, 14-inch guns], Marshall [Ft. Drum, 14-inch guns], and Koehler [Ft. Frank, 12-inch mortars] opened fire on Cavite targets. .....0924-Air Raid Alarm No. 77 sounded. .....0925-Nine heavy bombers, a new type in the area, bombed Middleside and Morrison Hill. .....0945-Twenty-seven heavy bombers came in over tail of Corregidor and bombed Middleside, closely followed by 17 heavies bombing Topside. .....0950-Twenty-five planes followed by 9 more made another attack. Meanwhile, artillery shells from enemy batteries in Cavite were bursting on Corregidor. Several fires were started, communication cable and water mains cut, and an ammunition dump of 75-mm. shells on Morrison Hill was set off. These shells were exploding for hours. Battery Wheeler [12-inch guns] had a direct bomb hit on the racer of No. 1 gun putting it out of action temporarily. .....1435-Air Raid Alarm No. 78. Nine heavy bombers approached Corregidor from the southeast. Bombs dropped on Kindley Field. .....1438-Seven more planes from southeast with more bombs. Shelling from mainland also. .....1552-Air Raid Alarm No. 79. Nine heavy bombers hit Kindley Field again. .....1640-Air Raid Alarm No. 80. Mariveles and Cabcaben areas [Bataan] hit by 9 heavies. .....2053-Air Raid Alarm No. 81. .....2115-First night air raid. Two medium bombers dropped incendiary bombs in Cheney Ravine, Corregidor. Later returned and bombed Bottomside. No damage reported. the blow from a bomb and had made liberal use of sandbags. "It used to be hard to get the men to fill sandbags," wrote one officer. "Now it is hard to keep them from laying hands on all the sandbags available and filling them when those to whom they are allotted aren't looking. "43 The small number of casualties is ample evidence of the thoroughness with which the Corregidor garrison had dug in since the first attack on 29 December. Installations of all kinds and critical supplies had also been placed under bombproof protection, and these suffered little damage during the bombardment. The few remaining surface installations, however, and supplies in open storage did not fare so well. On Bottomside, the theater, post exchange, and bakery were leveled to the ground and the Navy's radio station damaged. Wainwright's house, inherited from MacArthur, was destroyed on the first day of the attack. "I picked up the light walking stick which MacArthur had left for me," wrote Wainwright, "and walked down to Malinta Tunnel to live there the rest of my time on Corregidor. "44 Several ammunition dumps were hit, exploding the shells in storage, and a quantity of TNT blown up. But losses, on the whole, were small and were quickly repaired by crews which cleared the roads and cleaned out the debris left by exploding bombs. The Japanese, too, seemed to have profited by their earlier experience and had "learned," Captain Ames observed, "to dodge AA fire. "45 They came in at higher altitudes than before, between 22,000 and 28,000 feet, in formations of nine planes or less. During daylight they made their bombing runs out of the sun, changing course and altitude immediately after the moment of release. Earlier the antiaircraft gun batteries had been able to get in about ten salvos before the Japanese flew out of range, usually bringing down the lead plane of the formation. When the enemy changed his tactics, the antiaircraft guns could get in fewer salvos and could no longer count on the lead plane maintaining the same course. Under ideal conditions antiaircraft guns form a ring around the defended area, or a line in front of it, from where they can strike enemy aircraft before they reach the objective. On Corregidor it was not possible, for obvious reasons, "to follow the book." The antiaircraft guns could not engage the enemy until he was almost over the island. Moreover, by being located on the target, they became "part of what is being bombed," with the result that their efficiency and freedom of fire was limited most at the moment of greatest need. "Naturally our job is to fire on the bombers," wrote Captain Ames, ". . . and if possible prevent the bombing. Fire we do, but prevent the bombing we cannot." In a letter which never reached his wife he graphically explained the difficulty which beset all the antiaircraft men. The most serious limitations on the effectiveness of the 3-inch guns arose from the shortage of mechanically fuzed ammunition, which could reach to a height of 30,000 feet. There was an adequate supply of ammunition with the powder train fuze, effective to a height of about 24,000 feet, but only enough of the longer range type for one of the ten antiaircraft batteries. On 3 February a submarine had brought in 2,750 more rounds of mechanically fuzed ammunition, and it became possible to supply an additional battery. Thus, when the enemy planes came in at an altitude of more than 24,000 feet, only two batteries could reach them. The remaining batteries of the antiaircraft command, equipped with powder train fuzes, could only watch idly while the Japanese leisurely dropped their bombs. Nonetheless, the contribution of these batteries, though negative, was a valuable one. By forcing the enemy to remain at extremely high altitude, they decreased his accuracy and diminished the effectiveness of the bombardment. From the outset it had been necessary to conserve even the powder train fuzed shells, 30 percent of which were duds. This had been accomplished by limiting each gun to six rounds for any single target on any given course. The opening weeks of the war proved the most expensive in terms of rounds fired to planes destroyed, 500 rounds being required for each plane. This inaccurate fire was due to inexperience, the irregular functioning of powder train fuzes, and variation in the muzzle velocity. Between 8 December and 11 March the 3-inch gun batteries in the harbor defenses expended over 6,000 rounds for a total of 52 aircraft knocked down, or about 120 rounds per plane. With increased experience of both fire control crews and gunners and improved fire discipline, this average was steadily bettered until, by the beginning of April, the expenditure rate went under 100 rounds per plane, an excellent score even under the most favorable conditions. In February an effort was made to use the 12-inch mortars for antiaircraft fire in the hope that a salvo from these pieces, bursting in the midst of the enemy formation, would discourage mass bombing. The 670-pound shells were first fitted with the powder train fuze but the shell would not explode. Next, the 155-mm. shrapnel and the mechanical antiaircraft fuze were tried, but they failed also to detonate the charge. "If it can be made to work," thought Colonel Bunker, "it will sure jolt the Japs. "47 But the problem was never solved, and at the end of the campaign Ordnance still did not know whether the 12-inch shell would not explode because of the low rotational velocity or the size of booster charge in the fuze. abandoned the attack altogether. Those that got through were apparently too nervous and too anxious to get back to bomb with any accuracy. On the whole, the night attacks proved ineffective and after 6 April were discontinued. By the beginning of April, the aerial bombardment was virtually over. Little additional damage had been received and comparatively few casualties had been suffered by the men who had had two months to prepare. All eyes were now turned to Bataan, upon which the Japanese had concentrated their entire air and artillery strength in preparation for the final assault. For the next ten days, while the fight for Bataan ran its grim course to a bloody and tragic end, the men on Corregidor and its sister fortresses were granted a brief respite. Their turn, they knew, would come soon.